First time build questions? - Projects - Drive On Wood! Auto text got me again!!! I found you and your pictures on FB Chardad and it was almost like looking in the mirror as nearly everything you have on there I also have ! my collection of slag paper weights have had to be sold off to make room for new ones arriving each week . The tubs that you use for your gasifier are what I use to collect my charcoal in to allow it cool down outside from my wood burning fire in the house , I’m also very interested in how well your nozzles are holding up just a small amount sticking out the top of your dog dish seems to be a easier way than my casting nozzles I may have to give it a go , I have got to the point where my nozzles are pretty good and last me anywhere between 40 and a 120 odd hours run time , all depends on how hard the engine is working though . Cant wait to see a video of your setup running , cheers for the photo’s . Visited your fb. Looking good! You mentioned it being overpowered. May l a advise useing a smaller air nozzle. This way you reduce airflow thus gas output, and allso increase air speed wich favours richer gas oroduction and allso keeps the heat a bit away from the nozzle tip. oven. I have another muffler for a 10 hp+ ice that gives a much softer narrower flame that works good for pasta kettles and fry pans and such. Chardad this reminds me of an experiment I did a couple years ago with a computer fan and a water heater burner. I put a door on for easy acess inside, but ill need to put some kind of seal on it… anybody got any ideas what would be good to use? 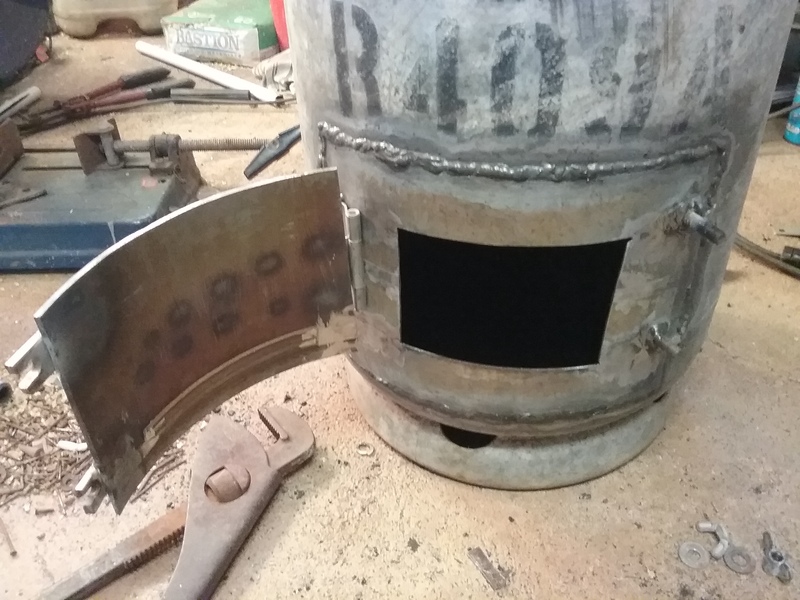 As you can see my welding is fairly crap, i only have a cheap arc welder. I think i will put red silicone on all my welds just to be sure theyre air tight. 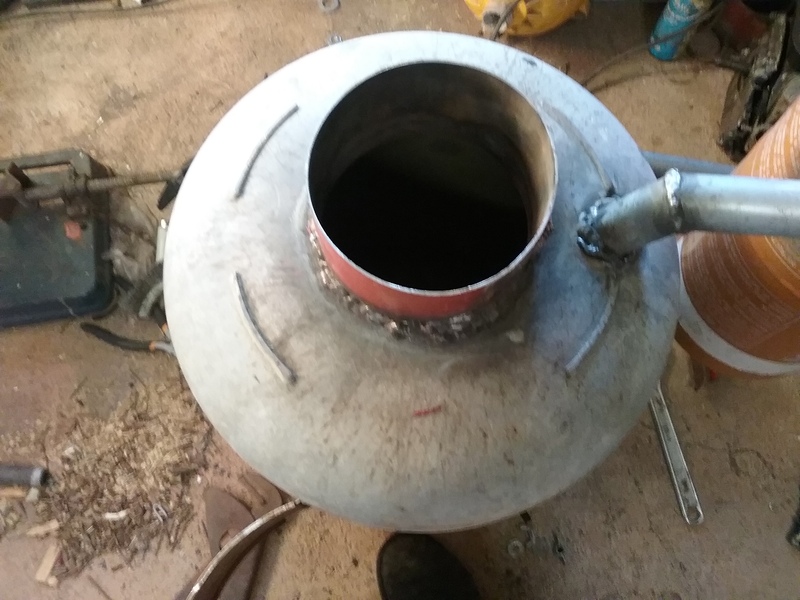 My next dillema is the puffer lid, im thinking of using a saucepan that fits snuggly and some springs, but i will need some sort of seal on this too. Hi Jamie , looking good so far , i think i can just make out the inlet to the nozzle on the last photo, so being pretty close to the hatch opening u will have high temps there , so i would just pop down to the local wood heater shop and buy a couple of meters of 6mm round fire rope , they also sell the flat rope too that is about 3mm thick both cost about $ 12 au a meter and if your door seats ok then that may be the best to get , they also sell the high temp adhesive , but thats about $20 for a small bottle , i used high temp rtv to glue my rope onto the hatch but expect to dab a bit on every month or so as it burns off . No real need for a puffer lid normally because if you were to get a blow back it normaly blows it out of the nozzle tube . so i would just use a gasket from rtv onto a flat plate or that pan you have there and held down with springs or whatever you handy , as the lid is where you refill it dont really get that hot and you will want it easy opening for refilling . Looking at how far you have progressed my guess is tomorrow afternoon (long as u have some charcoal ready ) i think you should be having a little barbie . I know the red silicone says it’s good to 600 degrees, but if you’re not sure how hot it will get, this could ruin your day. I’ve had better luck with this stuff, recommended by Matt. I’d put a double layer, one layer overlapping the joint(s) of the previous layer or maybe a layer on the door and a layer on the body staggering the joints. Good luck, sealing the unit is crucial to producing good gas. Gas mixed with air (oxygen) is explosive, use care. I’ve also used the product Dave and Brian suggested with good results. I have learned the hard way there is no other 100% junction in woodgas thain a pure good old weld. Yes, the rtv says 300c, but reality says a different srory. You get a pinhole in the seal for what ever reason, air gets in, combusts gas and start burning the seal. Otherwise, a glassfibre rope with s rtv coating works ok.
Has anybody used this before? Its different to the fibreglass rope and compresses to half its size for better sealing. 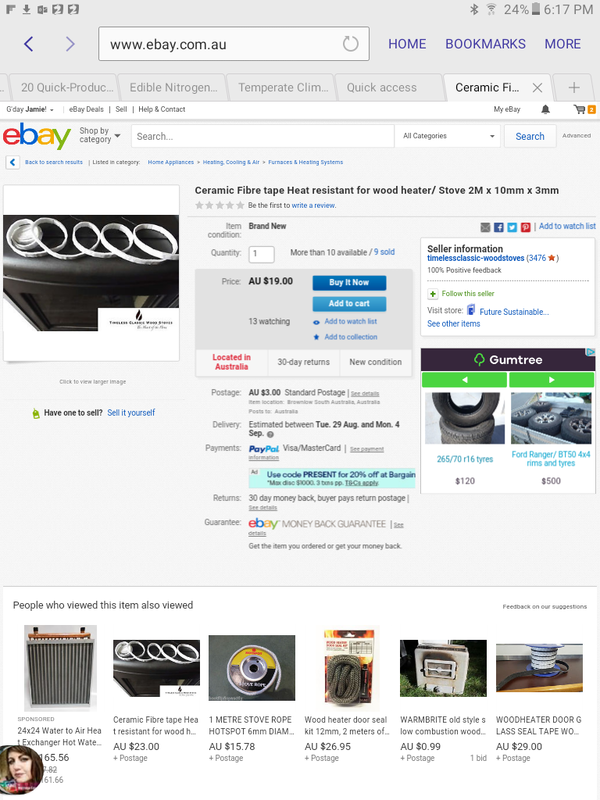 Similar stuff I found listed here on flea bay in the USA is only 1/8 inch thick or less. It doesn’t mention how much it compresses. I can’t imagine that working direct replacement for rope gasket, but maybe in other applications it would be good. I haven’t used this product, but I cringe at the term “heat resistant”. Yes. I have seen this flat-tape used. O.K. on flat ground thick flanges. For your lower door as pictured you’d be much better with thicker, rounder fiberglass rope, compressing down. Expect to have to use 2, maybe even 4 latches on that door. And best those latches have heat resisting stand-off constant pressure applying springs. Big opening nice for service - but big headaches to keep sealed with heating expansions and cooling-down contractions. I agree that it will be a challenge to seal the door. Use a non-contact thermometer to watch for hot spots. Tip for sealing cyclone or other similar opening: Smooth the sharp edges on the lip of the cyclone opening. On your lid of choice, spread a wide enough ring of red silicone to cover the cyclone lip and let set for 10 minutes. Cover this slightly cured ring of silicone with thin plastic food wrap and trim the excess wrap. Leave just enough plastic to cover the silicone. Cut and remove the plastic inside and outside of this ring of silicone to allow silicone to off-gas and cure. Gently position your lid on top of the cyclone. Carefully press or weight just enough for the lip of cyclone to sink slightly into silicone. Mark lid and cyclone body so the lid can be returned to this mating position. Let cure completely and remove plastic wrap separator for a perfectly matched silicone rubber seal on your lid. I usually wait a few days and carefully check the silicone for cure before removing the plastic. The past few days I have been playing with one of my smaller gasifiers , its a 200mm dia tube that’s just under 800 mm high with a hinged gas outlet lid , the nozzle is underneath pointing straight up the middle , so with only around 90mm at best between the flame front and the wall of the tube my temps get up to around 240deg’s c , so if Jamie just uses some red rtv so he can stick on the 6mm round fire rope onto the door I don’t think the temps will go above the critical and will be fine . 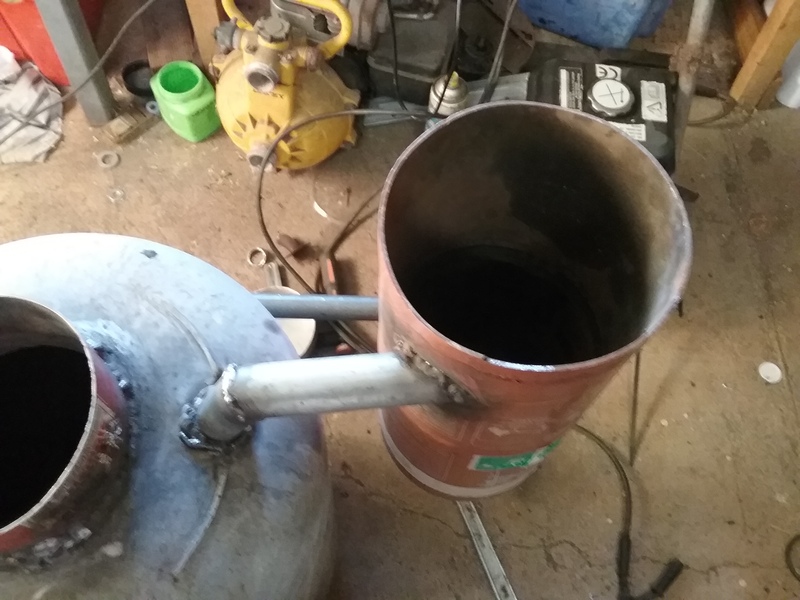 In fact while using this small tube like gasifier I noticed just how hot the outside can get I decided to enclose the bottom half of it with a small paint drum approx. 300 dia and 350mm high ,leaving just enough gap for me to fill up with waste plastic and feed the vapour’s from a flexi tube at the top down into the air intake . 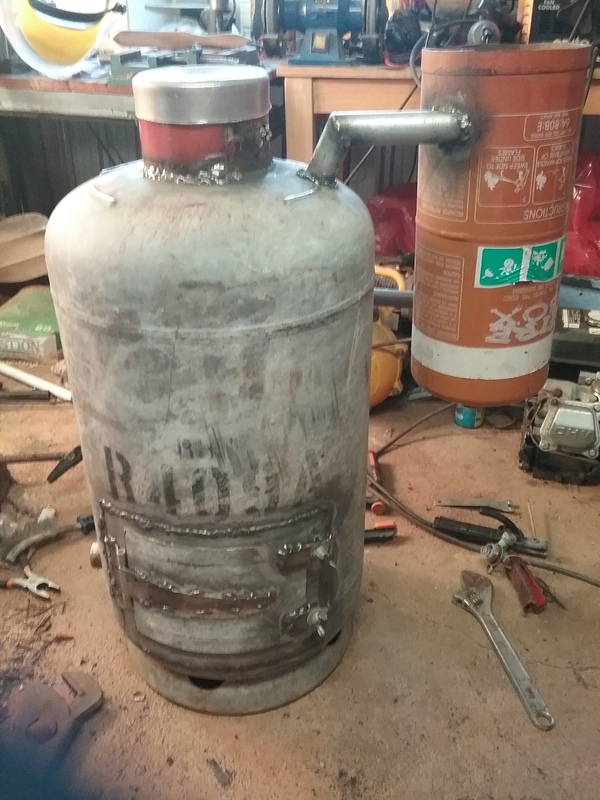 What progress can you report about the mini gasifier?